The Fallout 76 beta went live on PC last night, and it’s fair to say there were a few issues. Bethesda’s promise of “spectacular” bugs wasn’t for nothing, but one of the most worrisome for the long-term health of the game is a speed bug tied to frame rate. You can essentially speed hack by unlocking the frame rate, and it’s as simple as editing the ini file. You can disable VSync via the ini file, which as always lets you run the game at speeds beyond your monitor’s refresh rate. That’s standard for Bethesda games, and it looks like there’s no exception for Fallout 76, despite it being a multiplayer game. That kind of customisation freedom is generally good, but it’s got some unusual consequences here. Fallout 76 makes use of the same engine as Fallout 4, and that game similarly had its physics tied to frame rate, as you can see here. That issue has been patched to various degrees over the years, but hasn’t been fixed in time for Fallout 76. A Reddit thread offers one example, and the video below (via SuperSpacedad on Twitter) is an even more dramatic example of the problem. 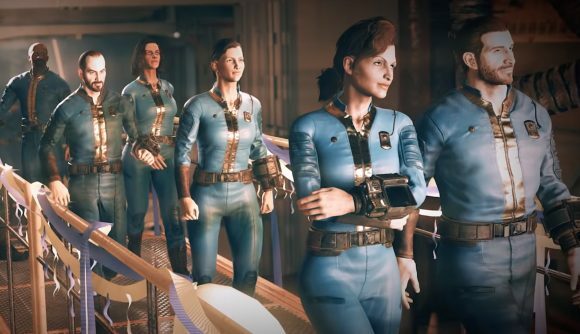 A Bethesda rep tells Polygon that the studio is aware of the issue, but there won’t be a fix until the Fallout 76 release date. That means you’re going to be playing the remainder of the beta with folks looking to take advantage of the boosts to move speed. But exactly how that fix is implemented remains a point of concern. Since this issue has been a part of Bethesda’s engine for years, it’s unlikely to get a last-minute miracle fix. Instead, it’s likely that a frame rate cap will be more strictly enforced in-game, at the expense of options for users on high-refresh monitors. Hopefully that doesn’t include forced VSync for those who prefer to play without, but we’ll see heading into November 14.